Some are calling President Trump's first visit overseas as president, a "world religion" trip because he met with kings in the Islamic world, the Prime Minister of Israel and the Pope. However, most see it as a trip that reestablished leadership of the United States in a world that is upside down---in great part because of the leadership vacuum caused by the United States' previous president. 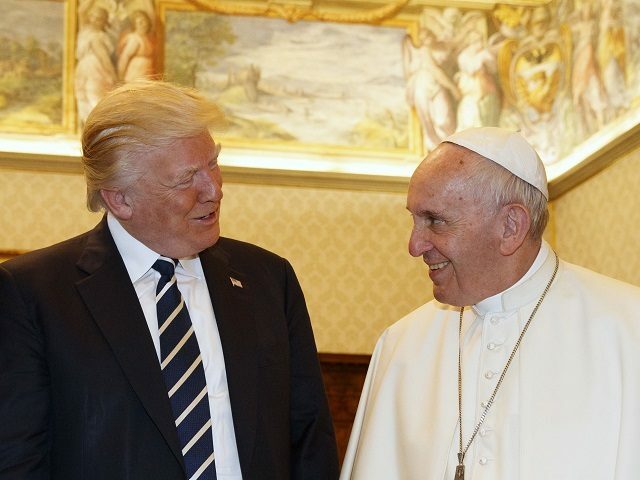 Contrary to America's far Left media predictions, the Vatican described the meeting as "cordial" and the two men agreed "in favor of life, religious liberty and freedom of conscience." Breitbart News noted that "Contrary to mainstream media predictions, the meeting involved no sulking or scolding, and the two men honestly seemed to enjoy each other's company." They exchanged gifts, and talked about moral beliefs, world conditions---and of course peace. The Pope gave the President a sculpted olive tree, symbolizing peace. The President said, "We could use some peace." The Pope also gave the President, in addition to copies of his own writings as Pope, a few books to read, including his own, "The Joy of the Gospel," which talks about having a personal relationship with Jesus along with fighting for social justice. The President gave the Pope a blue box which contained the writings of Rev. Martin Luther King Jr., saying, "I hope you like them." Interesting that President Obama didn't think to do that. While the press tried to make much out of the back and forth between the Pope and candidate Trump---I'll get to that in a moment--- the Catholic Church and the Pope were often at odds with the Obama administration over issues of abortion and religious freedom. A press release from the Vatican underscores the joint commitment between the President and the Pope "in favor of life, religious liberty and freedom of conscience"---all issues where our previous president and the Pope held very opposing views. These polar opposite views were, of course, not mentioned by the "not very prophetic" mainstream media. However, Christian Broadcasting News (CBN) did. In fact, CBN's coverage was the best I saw. CBN had a close up view of the President's trip because they were part of a select group of press who came to the Vatican to witness a bit of history. They covered aspects the mainstream media missed or ignored. CBN did, in fact, properly cover the issues between the President and the Pope that occurred during the presidential campaign. They say, "Senior administration officials told them the world religion tour intentionally included the Vatican, to help reset Trump's relationship with the Pope"---they said "it got a bit testy during the campaign." You may recall the Pope took considerable issue with the President's insistence on building a "big beautiful border wall." The Pope said, "Someone who thinks about building walls and not bridges is not a Christian." The President (then candidate) responded, "For a religious leader to question a person's faith is disgraceful. I am proud to be a Christian and as president I will not allow Christianity to be consistently attacked and weakened." And he said the Mexican government "is using the Pope as a pawn and they should be ashamed of themselves for doing so, especially when so many lives are involved and when illegal immigration is so rampant. Italian newspaper columnist Massimo Franco wrote at the time, "A person who says 'no walls, but bridges' and the other who says 'walls, not bridges' is something which you cannot reconcile." Perhaps this could be a teachable moment for Mr. Franco in that he actually misrepresented what both the President and the Pope were saying. In that the Vatican is protected by a wall---and rightly so--The Pope would likely understand what the President understands, but Mr. Franco does not. Walls and bridges have their unique function. One provides for the other. Both can work for good. There is reason that so many want to come to America for a better life. The reason is because America provides a better life opportunity. There is also a reason why millions want to come to the Vatican every year. For most of them it is a place of hope and inspiration---but not all of them. Among the millions who want to come to the US, some come not for a better life, but to kill us because they disagree with our beliefs and values. The same can be said of the Vatican---thus their wall. A wall helps protect that great opportunity called the United States, for all who live here, and for those who come by way of the legal immigration bridge. A wall protects the Vatican and those who serve within it, and its controlled security gates provide a bridge for those who appropriately enter. The Vatican press release expresses a common desire for "serene collaboration between the State and the Catholic Church in the United States engaged in service to the people in the fields of healthcare, education and assistance to immigrants." After his meeting with Pope Francis, the President and First Lady had a private tour of the Sistine Chapel where they viewed Michelangelo's iconic ceiling fresco painting, "The Creation of Adam"---the most replicated religious painting of all time---and his equally famous fresco, "Last Judgment"---which depicts the Second Coming of Christ and the final and eternal judgment by God of all humanity. That puts everything in perspective for the President, the Pope, and hopefully, all the rest of us. As far as I can tell, if the city above has gates, I assume it has walls, and whatever is outside those walls, isn't good. Perhaps the comments indicating building walls is not Christian come from believing God will actually accept everyone to Heaven in contradiction to His own Word. To hold such a belief would seem to display a poor understanding of Scripture and this is disappointing to find in a leader of a Christian church.